This will be a slightly different kind of character profile as most of my others only have one illustration. Not that the other characters don’t have other illustrations, but I felt that this one deserved to have a more in-depth examination–aside from the fictitious character himself. Jackson stood impatiently next to Brink, examining the lobby with a bored expression. His tunic and thick pants accentuated more of his muscular physique. His golden blonde hair was combed back neatly, concealing its subtle waves. 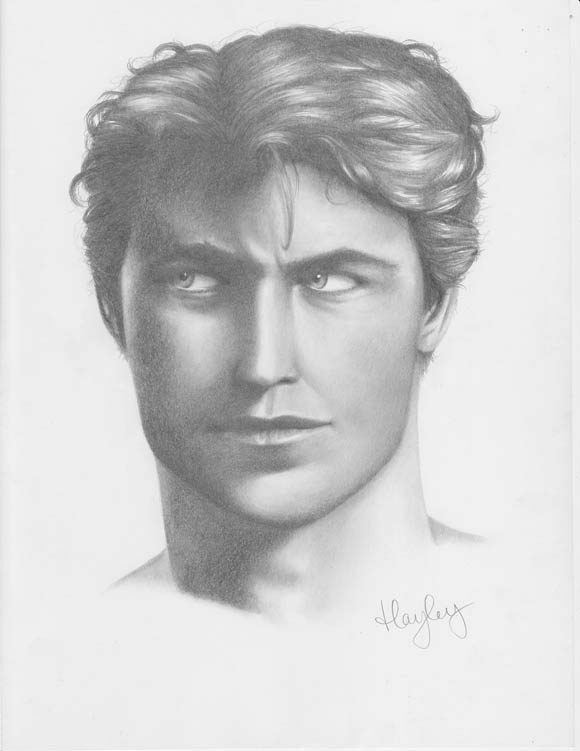 His light blue eyes were striking, a compliment to his incredibly handsome face despite his unpleasant expression. It was obvious why he got so many looks from excitable young women. He was designed with a stereotype in mind: good-looking, charming, and yet lacking in selflessness and kindness. Think of him as Uncle Scrooge. He’s important to my story because his life weaves a tale of redemption. His childhood is full of neglect and abuse which fuels his intoxicated and promiscuous adulthood. Which is super cliche, I know. But I wanted a relatable–broken–man in this fantasy realm of mine. Pain transcends most genres, but why not a struggle that does that as well? 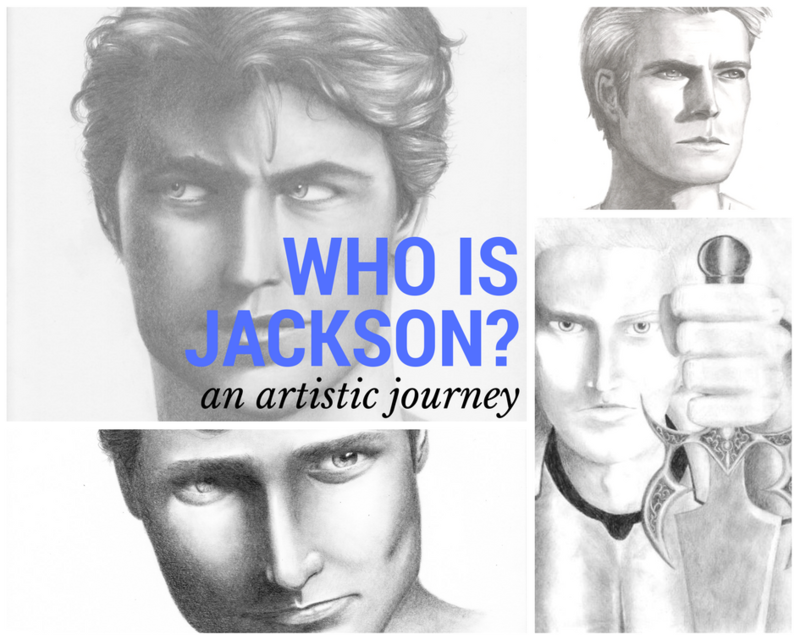 Without going into more detail about my story and the character himself, I wanted to take a different spin on this particular ‘Character Portrait’ and talk about my own journey with Jackson. 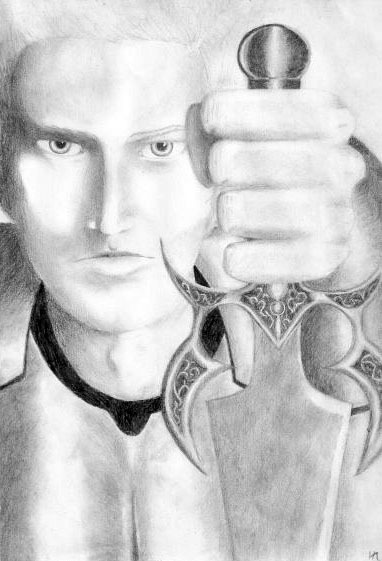 Jackson has been a concept rolling around in my head for some time (I drew this picture below MANY years ago). 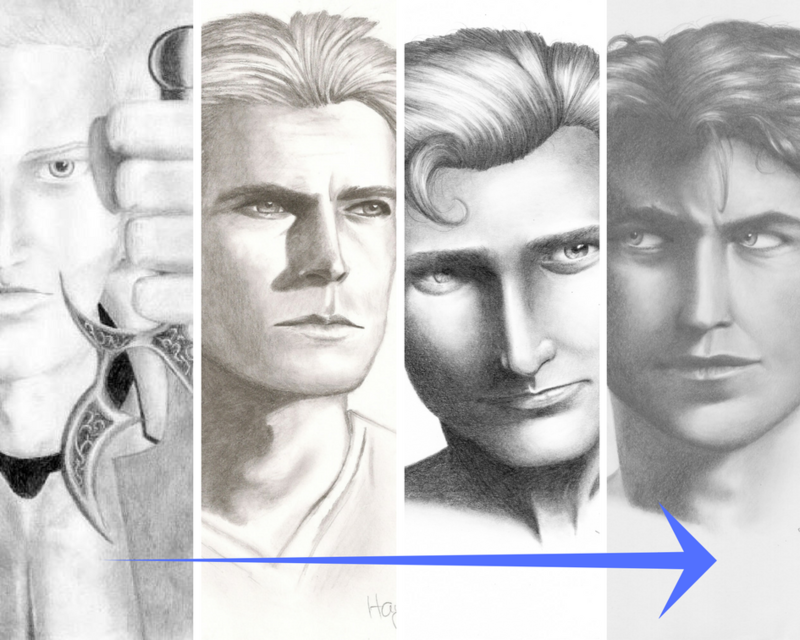 And–like the character’s personal development–I grew in my own personal way (hint: it was a lot of practicing, torn sketchbook pages, and crying). The arts aren’t always easy–even to those of us who seem to have a knack for it. The struggle is real and will continue even into the advanced stages (hopeful sounding, I know). But the important thing is to continue on. No matter how great you think a piece turned out or if you think it belongs in the trash. It also helps to learn from others. They can aid you in your own artistic journey. Well, actually that’s only a nickname. But I won’t spoil his real name for you. If I ever get my story published to some affect, you’ll find out. You should know, he’s not an elf. His race I’ve named Omati (oh-MAW-tee). Brink is actually only half, so he doesn’t exhibit all of the physical characteristics of his people, but one major thing he does have are his ears. Brink jerked back in fear and stood next to Harlow, his long pointed ears twitching in panic like that of a frightened cat. Brink’s ears sagged and he swallowed the returning lump in his throat. Now completely blind from the darkness, he slowly felt, and listened, his way back towards his traveling companions, hoping the dreadful noises he heard were in their favor. I must admit, he’s probably my second favorite character–Rando being my first–and not just because of his sweet and meek personality. As cliche as it seems, he has near perfect aim with just about any weapon. Not that he hits his mark exactly on the dot 100% of the time–but he always hits what he’s aiming at. He–and two of the other characters–work as “Hunters”. Which, as the name suggests, they hunt. But they don’t hunt your typical animals. They hunt monsters, for a bounty. Brink begins as the team’s sniper. Always attacking long-range, usually with a gun. Later in the story, he acquires a bow and arrow–essentially becoming Hawkeye. Not without practicing of course, his talent is not completely unrealistic. To their amazement, Brink swiftly drew an arrow, one right after the other, and all three arrows met their intended targets before hitting the ground. Without warning him, Theodas tossed the rest of the fruit into the air in random directions. Brink, taken by surprise, watched the objects fly through the air with a careful eye. After only a few seconds, he drew three arrows at once and splattered most of the fruit. But not before shooting down the few closest with incredible speed. His friends stood shocked at his superior skill. “Brink! You’re incredible! Why have you been using a gun this whole time?” Harlow exclaimed in amazement. “Where did you learn?” Rando asked. Seems odd for a character with poor vision, right? Of course his superior hearing comes into play, but he’s a character made up of contradictions like that. 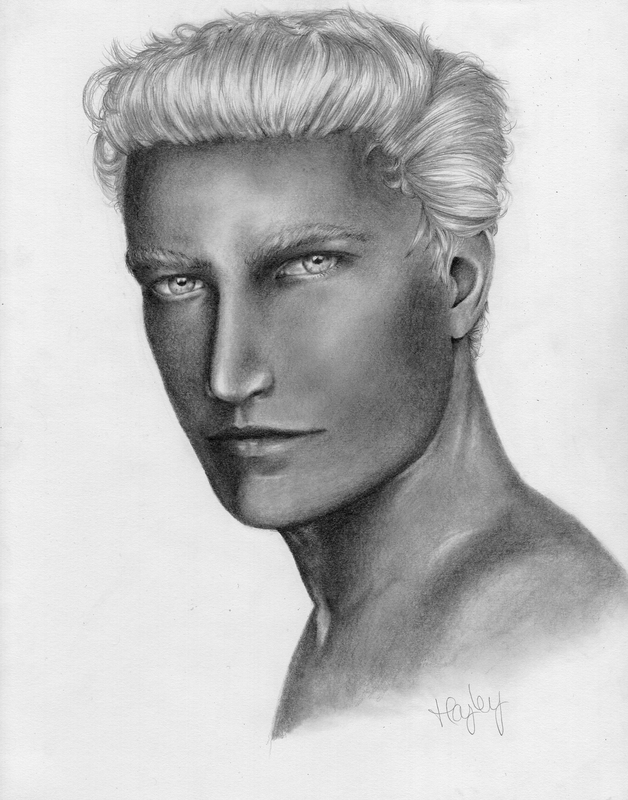 His genetics are created from two very different and opposing worlds–humans and the omati. I won’t go into their history here, but it’s something that Brink struggles with and has to come to terms with eventually. He has to reconcile his identity and learn to live between them equally. Yet, despite his inner turmoil he remains kind and gentle, not wanting to inflict his pain on others. In his portrait, I wanted to incorporate that–giving him a subtle smile and distant eyes. In fact, he even looks a little happy wouldn’t you say? Let me know what you think in the comments or shoot me an email! And, of course, don’t forget to check back later for a new character story! 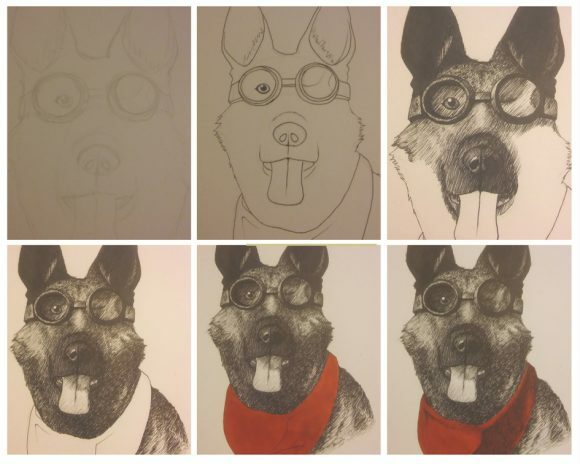 If you follow me on Facebook at all, you’ll know that my latest project is “Dogmeat”. In case you didn’t know, he’s a companion in the game Fallout 4. Although, I have yet to play the original Fallout games, it’s one of my favorite game franchises. My husband and I both played and replayed Fallout 3 and New Vegas until we knew every inch of those maps. So, it was natural that we were in line outside at 11 o’ clock on a weekday in 50 degree weather to get the early release of Fallout 4. I’ve already done a sketch of Nick Valentine (my personal favorite companion) which is up on my Society6 store. But, Dogmeat was naturally my next subject. He has been as loyal as a dog should be–showing up again in the next installment to help the player. Nothing has really changed about him, aside from the graphics. Except, this time, he becomes a major part in the plot of Fallout 4–only adding to his loveability in my opinion. I wanted to capture his loyalty and easy-to-love personality in this piece. He’s dressed and ready for battle, or exploration, or whatever adventure his master–the player–wishes. How can you resist such a sweet face? It’s come to my attention that I haven’t really told anyone the stories behind the character sketches I’ve done. My short answer is always an awkward “Oh, it’s just a random character” or “I don’t know”. Which, most of the time, is somewhat true. I often have images in my head of concepts–whether or not they go anywhere–especially of characters. I’m also a writer. I don’t really talk about it a lot, but I really enjoy writing stories as well (maybe I’ll publish one of them on here). 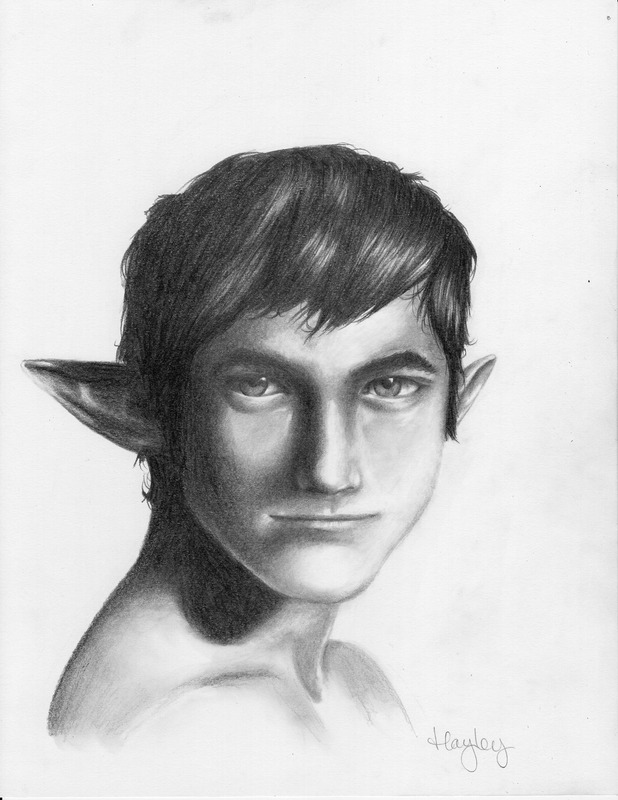 Thus, most of the portraits I draw are based on characters in my stories. My current work-in-progress is a brainchild that’s been floating around since high school. It’s changed multiple times of course, but I finally finished the first book a few months ago. It still needs quite a bit of editing as well. But, at least it’s on paper, right? Anyway, I’d like to start telling the stories behind my portraits and introducing the characters. Ultimately, to give them more life because I’m tired of giving a bland answer (besides, who doesn’t like a good story?). First up is my favorite character. Randolphus Koraenaz (cor-EHN-uh) (yes I made it up). He goes by “Rando” (and yes I realize that it’s slang for ‘random’–which is how I came up with his name to begin with. Although I didn’t know at the time–or it wasn’t slang then). What little sunlight illuminated the area, seemed to make this man’s hair glow. It was blonde, but almost white, which was in stark contrast with his dark tan skin. “I can’t place your accent,” she said, changing the subject. A wide grin grew across his face as he nodded slowly, his eyes seemed to twinkle. “That does come out occasionally. My first language is not common-tongue. I’m from Varou,” He replied folding his hands on the table. “I thought you seemed out-of-place,” Harlow replied smiling. “Is that common in Varou?” She inquired. The other character, Harlow, I’ll get to introduce later. Oh, and did I mention he was a sorcerer? With magical tattoos? Rando’s branded back really was impressive. In the middle of his back was a large circle with similar word scribbles along the edge. In the center of the circle was a star design, also with scribbled word-like brands. Altogether it resembled a complex compass rose. Other, smaller, geometrical designs surrounded the outside to complete the composition. Extending up over his shoulder blades and his upper arms were more organic looking patterns which mimicked vines or branches. On his lower back appeared lines of text, like that in a book. These however were not the common scribbles, but took on more hieroglyphic characteristics instead. “You’ve gotta show off too,” Theodas prodded. Without protest, Rando turned, extended his arm towards his curly-haired friend with his palm facing him. The whole group jumped back in surprise as a blue flame ignited on his arm. It then abruptly blasted a wide-eyed Theodas over the table and onto the floor. Without spoiling the rest of the story, I’ll leave it here. Intrigued? Good. I hope you can see his portrait through a different lens now. For this post I’d like to talk about movement and fluidity in your artwork. Which encompasses both action and stationary poses, living or inanimate. Many beginner artists seem to forget to add this to their pieces. Of course, it depends on what you’re trying to create—you won’t always use movement. Some abstract pieces for example (although movement is still important there as well). Week 16 & 17 of the Art Challenge! I chose to lump these two together because they’re basically the same, just different people. Week 16 is a caricature of myself and 17 being a caricature of a friend (I chose my husband). The one of myself is my D&D character (yes I am that geeky) so she doesn’t look too much like me, but it IS supposed to be a caricature, not a self-portrait. 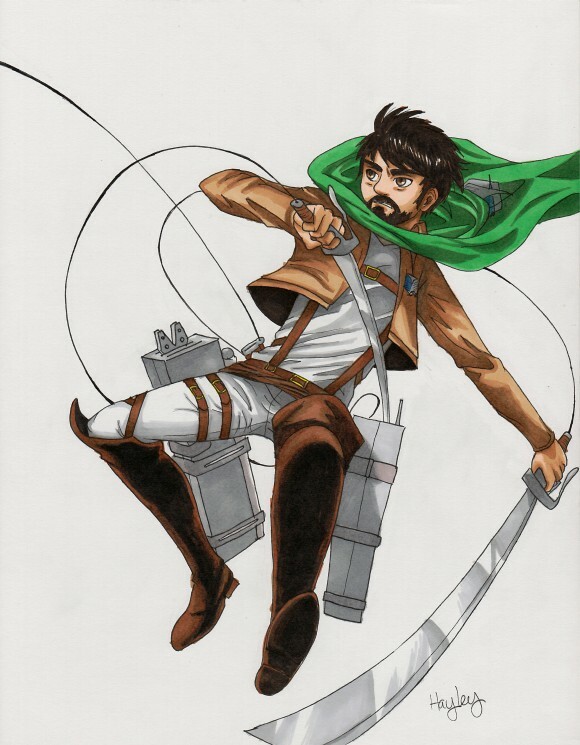 aaaaaaand my husband as an Attack on Titan character. Week 14 of the Art Challenge! #14 is “something metallic”. Metal is one of my favorite things to draw and is definitely good for practicing good observational skills. Next up is week 15, “Glass”. I chose to do a more quick-sketch version of this wine glass, so it looks a little less detailed. It’s no secret that art supplies are expensive. There’s a reason for the term “starving artist”. It’s difficult to be one. But, I want to share with you some secrets on saving money when it comes to art supplies. Actually, they’re not really all that secret, just common sense. This might be an obvious one, but even I forget to do this. It’s a good idea to watch out for sales when shopping for supplies. If you are able to check in advance with your local craft store, do so and plan ahead what you want to use. If not, just be sure to check back frequently. Most places have sales often. I know Hobby Lobby seems to have paintbrushes on sale every time I visit. If what you want is not on sale and you’d rather not wait–check online. Compare prices from different stores in your area. A lot of times you can find the exact same thing, but cheaper. Not always of course, but it doesn’t hurt to check. Coupled with tip #2, if you are able to, try to find wholesale websites and buy from them. You’ll be able to find name brand stuff, in larger quantities, for almost half the price–or less. Don’t worry about fancy materials. Keep in mind it’s how the artist uses what they have–not what the tools do. Comment below and let me know how you save money on art supplies! If you have any questions, feel free to email me. Just look under the ‘about’ section. Week 13 is titled “Your favorite movie”. Well mine just happens to be Kiki’s Delivery Service. If you haven’t seen it, you should, it’s a great family movie.